Prices hikes are one thing — but being relegated to the Netflix D-List with no recourse? That's enough to drive some customers straight back into the arms of torrents ... or maybe even DVD stores. Virtual private networks hit a major roadblock. So ... back to torrenting? Tensions are rising between Netflix and the people of Canada once again this week as more border-hopping subscribers find out first-hand that the streaming service wasn't bluffing about that whole "VPN crackdown" thing. This particular storm started brewing back in January, when Netflix announced that it would be taking steps to prevent members from using virtual private networks, proxies or unblocking services "to fool our systems into thinking they're in a different country than they're actually in." As most non-American Netflix users well know, the streaming service offers each of its roughly 190 markets different volumes and types of programming based on region-exclusive content licensing agreements. At press time, Canadian Netflix users could access approximately 4,000 movies and shows, while nearly 7,000 titles were available to subscribers in the U.S.
For many people, however, getting around geo-restrictions is as much about the quality of these titles as it is about quantity. Canadian Netflix has such a diverse array of terrible shows, it's almost impressive. <a href="https://twitter.com/Netflix_CA">@Netflix_CA</a> if US catalog has ~9k movies and Canadian catalog has 1/3, why we don’t pay 1/3 in Canada? ~3 bucks a month! Bye bye Netflix! Since Netflix announced that it would be cracking down on customers who use VPNs, intermittent reports of payment problems with unblocking companies have been rolling in — alongside reports of Canadians finding ways around these problems to continue watching U.S.-restricted Netflix content. This weekend, however, the tone among border-hopping Netflix viewers changed. Redditors and Twitter users have been frantically complaining of massive outages among subscription VPN services like Unblock-Us-com, which according to Postmedia's Jim Slotek "seems to have had its access [to] U.S. Netflix crippled" as of Sunday. Unblock-Us, which just two days ago was actively apologizing to customers on Twitter and Facebook for outages, now appears to have wiped all of the content from its Facebook page. While some tweets replying to customers remain intact, only one post, published Monday, can be seen by looking at the main Unblock-Us Twitter feed. "We're happy to help you 24/7!" it reads. "Please direct all your questions to https://support.unblock-us.com/." <a href="https://twitter.com/Unblock_Us">@unblock_us</a> <a href="https://twitter.com/getblockless">@getblockless</a> None of them are working anymore. Stuck with limited Canadian netflix library. Time to dump netflix. Crappers. 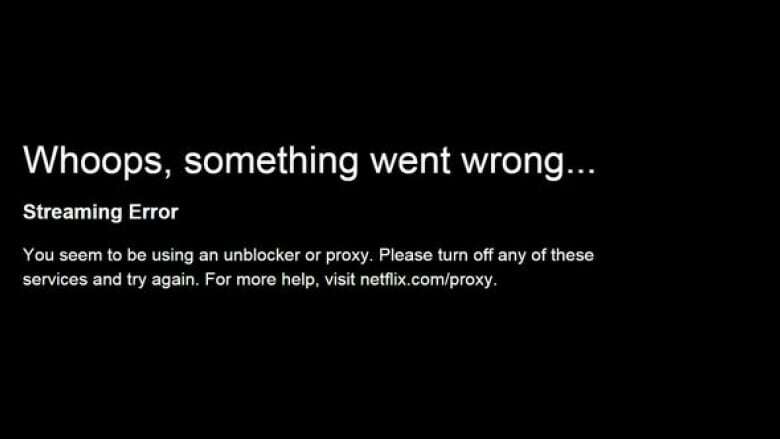 <a href="https://twitter.com/Unblock_Us">@Unblock_Us</a> it's Netflix who started to block proxies and vpn. Just wanted to know if you have found a workaround? TorrentFreak addressed this increase in Netflix-based VPN outage reports on Tuesday, writing that it had "spoken to several VPN service providers who have seen an increase in blocking efforts over the past several weeks." "Initially Netflix used static addresses for the geo-blocking checks. As a result, proxy and VPN operators could easily bypass these checks by forwarding this traffic to a 'clean' IP-address," the filesharing news site explained. "However, Netflix recently updated its detection methods and now uses hundreds of regularly changing domains." Adding insult to injury, Netflix CEO Reed Hastings blew off concerns over the VPN crackdown and how it might affect business during a live-streamed earnings call on Monday. "It's a very small but quite vocal minority," Hastings said of Netflix subscribers who use VPNs to access U.S. content from outside the country. "It's really inconsequential to us." Judging by the volume of angry online chatter about this issue in recent weeks, that "vocal minority" may not remain inconsequential to the company's bottom line forever. Shares in Netflix were down by about 10 per cent on Tuesday as investors digested the company's latest quarterly earnings and predictions that it would only add 2.5 million new customers during the next quarter, a much lower figure than the almost seven million customers it added during the first. It looks like Canadians can't be placated with Star Wars: The Force Awakens after all — especially when homegrown shows (like Degrassi) can only be viewed on Netflix by Americans.